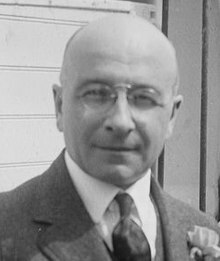 Alexis Carrel (French: [alɛksi kaʁɛl]; 28 June 1873 – 5 November 1944) was a French surgeon and biologist who was awarded the Nobel Prize in Physiology or Medicine in 1912 for pioneering vascular suturing techniques. He invented the first perfusion pump with Charles A. Lindbergh opening the way to organ transplantation. Like many intellectuals of his time, he promoted eugenics. He was a regent for the French Foundation for the Study of Human Problems during Vichy France which implemented the eugenics policies there; his association with the Foundation and with Jacques Doriot's ultra-nationalist Parti Populaire Français led to investigations of collaborating with the Nazis, but he died before any trial could be held. He faced media attacks towards the end of his life over his alleged involvement with the Nazis. Rockefeller Institute for Medical Research. A Nobel Prize laureate in 1912, Alexis Carrel was also elected twice, in 1924 and 1927, as an honorary member of the Academy of Sciences of the USSR. Born in Sainte-Foy-lès-Lyon, Rhône, Carrel was raised in a devout Catholic family and was educated by Jesuits, though he had become an agnostic by the time he became a university student. He was a pioneer in transplantology and thoracic surgery. Alexis Carrel was also a member of learned societies in the U.S., Spain, Russia, Sweden, the Netherlands, Belgium, France, Vatican City, Germany, Italy and Greece and received honorary doctorates from Queen's University of Belfast, Princeton University, California, New York, Brown University and Columbia University. In 1902, he was claimed to have witnessed the miraculous cure of Marie Bailly at Lourdes, made famous in part because she named Carrel as a witness of her cure. After the notoriety surrounding the event, Carrel could not obtain a hospital appointment because of the pervasive anticlericalism in the French university system at the time. In 1903 he emigrated to Montreal, Canada, but soon relocated to Chicago, Illinois to work for Hull Laboratory. While there he collaborated with American physician Charles Claude Guthrie in work on vascular suture and the transplantation of blood vessels and organs as well as the head, and Carrel was awarded the 1912 Nobel Prize in Physiology or Medicine for these efforts. In 1906 he joined the newly formed Rockefeller Institute of Medical Research in New York where he spent the rest of his career. There he did significant work on tissue cultures with pathologist Montrose Thomas Burrows. In the 1930s, Carrel and Charles Lindbergh became close friends not only because of the years they worked together but also because they shared personal, political, and social views. Lindbergh initially sought out Carrel to see if his sister-in-law's heart, damaged by rheumatic fever, could be repaired. When Lindbergh saw the crudeness of Carrel's machinery, he offered to build new equipment for the scientist. Eventually they built the first perfusion pump, an invention instrumental to the development of organ transplantation and open heart surgery. Lindbergh considered Carrel his closest friend, and said he would preserve and promote Carrel's ideals after his death. Due to his close proximity with Jacques Doriot's fascist Parti Populaire Français (PPF) during the 1930s and his role in implementing eugenics policies during Vichy France, he was accused after the Liberation of collaboration, but died before the trial. In his later life he returned to his Catholic roots. In 1939 he met with Trappist monk Alexis Presse on a recommendation. Although Carrel was skeptical about meeting with a priest, Presse ended up having a profound influence on the rest of Carrel's life. In 1942, he said "I believe in the existence of God, in the immortality of the soul, in Revelation and in all the Catholic Church teaches." He summoned Presse to administer the Catholic Sacraments on his death bed in November 1944. For much of his life, Carrel and his wife spent their summers on the Île Saint-Gildas, which they owned. After he and Lindbergh became close friends, Carrel persuaded him to also buy a neighboring island, the Ile Illiec, where the Lindberghs often resided in the late 1930s. Carrel was a young surgeon in 1894, when the French president Sadi Carnot was assassinated with a knife. Carnot bled to death due to severing of his portal vein, and surgeons who treated the president felt that the vein could not be successfully reconnected. This left a deep impression on Carrel, and he set about developing new techniques for suturing blood vessels. The technique of "triangulation", using three stay-sutures as traction points in order to minimize damage to the vascular wall during suturing, was inspired by sewing lessons he took from an embroideress and is still used today. Julius Comroe wrote: "Between 1901 and 1910, Alexis Carrel, using experimental animals, performed every feat and developed every technique known to vascular surgery today." He had great success in reconnecting arteries and veins, and performing surgical grafts, and this led to his Nobel Prize in 1912. Carrel co-authored a book with famed pilot Charles A. Lindbergh, The Culture of Organs, and worked with Lindbergh in the mid-1930s to create the "perfusion pump," which allowed living organs to exist outside the body during surgery. The advance is said to have been a crucial step in the development of open-heart surgery and organ transplants, and to have laid the groundwork for the artificial heart, which became a reality decades later. Some critics of Lindbergh claimed that Carrel overstated Lindbergh's role to gain media attention, but other sources say Lindbergh played an important role in developing the device. Both Lindbergh and Carrel appeared on the cover of Time magazine on June 13, 1938. Carrel was also interested in the phenomenon of senescence, or aging. He claimed that all cells continued to grow indefinitely, and this became a dominant view in the early 20th century. Carrel started an experiment on January 17, 1912, where he placed tissue cultured from an embryonic chicken heart in a stoppered Pyrex flask of his own design. He maintained the living culture for over 20 years with regular supplies of nutrient. This was longer than a chicken's normal lifespan. The experiment, which was conducted at the Rockefeller Institute for Medical Research, attracted considerable popular and scientific attention. Carrel's experiment by some was never successfully replicated, and in the 1960s Leonard Hayflick and Paul Moorhead proposed that differentiated cells can undergo only a limited number of divisions before dying. This is known as the Hayflick limit, and is now a pillar of biology. L. Hayflick has shown that a cell has a limited number of divisions, equal to the so called "Hayflick's Limit." However, L. Franks and others (Loo et al. 1987; Nooden and Tompson 1995; Frolkis 1988a), have shown that the number of cell divisions can be considerably greater than that stipulated by the "Hayflick Limit", having practically no limit at all. It is not certain how Carrel obtained his anomalous results. Leonard Hayflick suggests that the daily feeding of nutrient was continually introducing new living cells to the alleged immortal culture. J. A. Witkowski has argued that, while "immortal" strains of visibly mutated cells have been obtained by other experimenters, a more likely explanation is deliberate introduction of new cells into the culture, possibly without Carrel's knowledge. In 1972, the Swedish Post Office honored Carrel with a stamp that was part of its Nobel stamp series. In 1979, the lunar crater Carrel was named after him as a tribute to his scientific breakthroughs. In February 2002, as part of celebrations of the 100th anniversary of Charles Lindbergh's birth, the Medical University of South Carolina at Charleston established the Lindbergh-Carrel Prize, given to major contributors to "development of perfusion and bioreactor technologies for organ preservation and growth". Michael DeBakey and nine other scientists received the prize, a bronze statuette  created for the event by the Italian artist C. Zoli and named "Elisabeth" after Elisabeth Morrow, sister of Lindbergh's wife Anne Morrow, who died from heart disease. It was in fact Lindbergh's disappointment that contemporary medical technology could not provide an artificial heart pump which would allow for heart surgery on her that led to Lindbergh's first contact with Carrel. In 1902 Alexis Carrel went from being a skeptic of the visions and miracles reported at Lourdes to being a believer in spiritual cures after experiencing a healing of Marie Bailly that he could not explain. The Catholic journal Le nouvelliste reported that she named him as the prime witness of her cure. Alexis Carrel refused to discount a supernatural explanation and steadfastly reiterated his beliefs, even writing the book "The Voyage to Lourdes" describing his experience, although it was not published until four years after his death. This was a detriment to his career and reputation among his fellow doctors, and feeling he had no future in academic medicine in France, he emigrated to Canada with the intention of farming and raising cattle. After a brief period, he accepted an appointment at the University of Chicago and two years later at the Rockefeller Institute of Medical Research. In 1935, Carrel published a book titled L'Homme, cet inconnu (Man, The Unknown), which became a best-seller. In the book, he attempted to outline a comprehensive account what is known and more importantly unknown of the human body and human life "in light of discoveries in biology, physics, and medicine", to elucidate problems of the modern world, and to provide possible routes to a better life for human beings. [M]en cannot follow modern civilization along its present course, because they are degenerating. They have been fascinated by the beauty of the sciences of inert matter. They have not understood that their body and consciousness are subjected to natural laws, more obscure than, but as inexorable as, the laws of the sidereal world. Neither have they understood that they cannot transgress these laws without being punished. They must, therefore, learn the necessary relations of the cosmic universe, of their fellow men, and of their inner selves, and also those of their tissues and their mind. Indeed, man stands above all things. Should he degenerate, the beauty of civilization, and even the grandeur of the physical universe, would vanish. ... Humanity's attention must turn from the machines of the world of inanimate matter to the body and the soul of man, to the organic and mental processes which have created the machines and the universe of Newton and Einstein. We must single out the children who are endowed with high potentialities, and develop them as completely as possible. And in this manner give to the nation a non-hereditary aristocracy. Such children may be found in all classes of society, although distinguished men appear more frequently in distinguished families than in others. The descendants of the founders of American civilization may still possess the ancestral qualities. These qualities are generally hidden under the cloak of degeneration. But this degeneration is often superficial. It comes chiefly from education, idleness, lack of responsibility and moral discipline. The sons of very rich men, like those of criminals, should be removed while still infants from their natural surroundings. Thus separated from their family, they could manifest their hereditary strength. In the aristocratic families of Europe there are also individuals of great vitality. The issue of the Crusaders is by no means extinct. The laws of genetics indicate the probability that the legendary audacity and love of adventure can appear again in the lineage of the feudal lords. It is possible also that the offspring of the great criminals who had imagination, courage, and judgment, of the heroes of the French or Russian Revolutions, of the high-handed business men who live among us, might be excellent building stones for an enterprising minority. As we know, criminality is not hereditary if not united with feeble-mindedness or other mental or cerebral defects. High potentialities are rarely encountered in the sons of honest, intelligent, hard-working men who have had ill luck in their careers, who have failed in business or have muddled along all their lives in inferior positions. Or among peasants living on the same spot for centuries. However, from such people sometimes spring artists, poets, adventurers, saints. A brilliantly gifted and well-known New York family came from peasants who cultivated their farm in the south of France from the time of Charlemagne to that of Napoleon. (t)he German government has taken energetic measures against the propagation of the defective, the mentally diseased, and the criminal. The ideal solution would be the suppression of each of these individuals as soon as he has proven himself to be dangerous. (t)he conditioning of petty criminals with the whip, or some more scientific procedure, followed by a short stay in hospital, would probably suffice to insure order. Those who have murdered, robbed while armed with automatic pistol or machine gun, kidnapped children, despoiled the poor of their savings, misled the public in important matters, should be humanely and economically disposed of in small euthanasic institutions supplied with proper gasses. A similar treatment could be advantageously applied to the insane, guilty of criminal acts. We have mentioned that natural selection has not played its part for a long while. That many inferior individuals have been conserved through the efforts of hygiene and medicine. But we cannot prevent the reproduction of the weak when they are neither insane nor criminal. Or destroy sickly or defective children as we do the weaklings in a litter of puppies. The only way to obviate the disastrous predominance of the weak is to develop the strong. Our efforts to render normal the unfit are evidently useless. We should, then, turn our attention toward promoting the optimum growth of the fit. By making the strong still stronger, we could effectively help the weak; For the herd always profits by the ideas and inventions of the elite. Instead of leveling organic and mental inequalities, we should amplify them and construct greater men. The progress of the strong depends on the conditions of their development and the possibility left to parents of transmitting to their offspring the qualities which they have acquired in the course of their existence. Modern society must, therefore, allow to all a certain stability of life, a home, a garden, some friends. Children must be reared in contact with things which are the expression of the mind of their parents. It is imperative to stop the transformation of the farmer, the artisan, the artist, the professor, and the man of science into manual or intellectual proletarians, possessing nothing but their hands or their brains. The development of this proletariat will be the everlasting shame of industrial civilization. It has contributed to the disappearance of the family as a social unit, and to the weakening of intelligence and moral sense. It is destroying the remains of culture. All forms of the proletariat must be suppressed. Each individual should have the security and the stability required for the foundation of a family. Marriage must cease being only a temporary union. The union of man and woman, like that of the higher anthropoids, ought to last at least until the young have no further need of protection. The laws relating to education, and especially to that of girls, to marriage, and divorce should, above all, take into account the interest of children. Women should receive a higher education, not in order to become doctors, lawyers, or professors, but to rear their offspring to be valuable human beings. The free practice of eugenics could lead not only to the development of stronger individuals, but also of strains endowed with more endurance, intelligence, and courage. These strains should constitute an aristocracy, from which great men would probably appear. Modern society must promote, by all possible means, the formation of better human stock. No financial or moral rewards should be too great for those who, through the wisdom of their marriage, would engender geniuses. The complexity of our civilization is immense. No one can master all its mechanisms. However, these mechanisms have to be mastered. There is need today of men of larger mental and moral size, capable of accomplishing such a task. The establishment of a hereditary biological aristocracy through voluntary eugenics would be an important step toward the solution of our present problems. In 1937, Carrel joined Jean Coutrot's Centre d'Etudes des Problèmes Humains - Coutrot's aim was to develop what he called an "economic humanism" through "collective thinking." In 1941, through connections to the cabinet of Vichy France president Philippe Pétain (specifically, French industrial physicians André Gros and Jacques Ménétrier) he went on to advocate for the creation of the Fondation Française pour l'Etude des Problèmes Humains (French Foundation for the Study of Human Problems) which was created by decree of the Vichy regime in 1941, and where he served as 'regent'. The foundation was at the origin of the October 11, 1946, law, enacted by the Provisional Government of the French Republic (GPRF), which institutionalized the field of occupational medicine. It worked on demographics (Robert Gessain, Paul Vincent, Jean Bourgeois-Pichat), on economics, (François Perroux), on nutrition (Jean Sutter), on habitation (Jean Merlet) and on the first opinion polls (Jean Stoetzel). "The foundation was chartered as a public institution under the joint supervision of the ministries of finance and public health. It was given financial autonomy and a budget of forty million francs—roughly one franc per inhabitant—a true luxury considering the burdens imposed by the German Occupation on the nation's resources. By way of comparison, the whole Centre National de la Recherche Scientifique (CNRS) was given a budget of fifty million francs." The Foundation made many positive accomplishments during its time. Yet it was also behind the origin of the December 16, 1942 Act inventing the "prenuptial certificate", which had to precede any marriage and was supposed, after a biological examination, to insure the "good health" of the spouses, in particular in regard to sexually transmitted diseases (STD) and "life hygiene" [sic]. The institute also conceived the "scholar book" ("livret scolaire"), which could be used to record students' grades in the French secondary schools, and thus classify and select them according to scholastic performance. According to Gwen Terrenoire, writing in Eugenics in France (1913-1941) : a review of research findings, "The foundation was a pluridisciplinary centre that employed around 300 researchers (mainly statisticians, psychologists, physicians) from the summer of 1942 to the end of the autumn of 1944. After the liberation of Paris, Carrel was suspended by the Minister of Health; he died in November 1944, but the Foundation itself was "purged", only to reappear in a short time as the Institut national d'études démographiques (INED) that is still active." Although Carrel himself was dead most members of his team did move to the INED, which was led by famous demographist Alfred Sauvy, who coined the expression "Third World". Others joined Robert Debré's "Institut national d'hygiène" (National Hygiene Institute), which later became the INSERM. Experiments with the Carrel-Dakin method were depicted in the 2014 BBC miniseries, The Crimson Field. ^ a b Sade, Robert M. MD. Alexis Carrel, Pioneer Surgeon Medical University of South Carolina, Charleston, South Carolina. ^ Reggiani, Andrés Horacio. God's Eugenicist. Alexis Carrel and the Sociobiology of Decline. Berghahn Books, Oxford 2007. ^ Schneider William H.. Quality and Quantity: The Quest for Biological Regeneration in Twentieth-Century France. Cambridge UP 1990, pp. 272-282. ^ Friedman, David M. (2007). The Immortalists: Charles Lindbergh, Dr. Alexis Carrel, and Their Daring Quest to Live Forever. New York, NY: Ecco/HarperCollins. p. 140. ISBN 978-0-06-052815-7. ^ Sade, Robert M. (2005). "Transplantation at 100 Years: Alexis Carrel, Pioneer Surgeon". The Annals of Thoracic Surgery. 80 (6): 2415–2418. doi:10.1016/j.athoracsur.2005.08.074. PMID 16305931. ^ a b c John G. Simmons (2002). Doctors and discoveries: lives that created today's medicine. J Natl Med Assoc. 94. Houghton Mifflin Harcourt. pp. 199–204. ISBN 978-0-618-15276-6. PMC 2568410. ^ a b Fossel, Michael B. (2004-06-02). Cells, Aging, and Human Disease. Oxford University Press. p. 504. ISBN 978-0-19-514035-4. ; page 24. ^ Carrel, Alexis (1912-05-01). "On the Permanent Life of Tissues Outside of the Organism" (PDF). Journal of Experimental Medicine. 15 (5): 516–528. doi:10.1084/jem.15.5.516. PMC 2124948. PMID 19867545. Retrieved 2009-05-28. ^ Rasko, John; Carl Power (18 February 2015). "What pushes scientists to lie? The disturbing but familiar story of Haruko Obokata". The Guardian. Retrieved 19 February 2015. ^ Hayflick, L. (November 1997). "Mortality and Immortality at the Cellular Level. A Review". Biochemistry (Moscow). 62 (11): 1180–1190. PMID 9467840. ^ Witkowski, JA (1980). "Dr. Carrel's immortal cells". Medical History. 24 (2): 129–142. doi:10.1017/S0025727300040126. PMC 1082700. PMID 6990125. ^ Witkowski explanation is actually based on the account of a visiting medical researcher, Ralph Buchbaum, who reports being told by a technician in Carrel's lab "Dr. Carrel would be so upset if we lost the strain, we just add a few embryo cells now and then". After the first six months, Carrel's colleague Albert Ebeling had actually taken charge of the cultures and published several papers about their development, until they were eventually discarded in 1946. Witkowski, in "Dr. Carrel's immortal cells", op. cit., quotes Buchbaum's account. At the end Buchbaum writes that "I told this story, of my visit to Carrel's laboratory, to various people. Dr. Bloom (Buchbaum's director of research in Chicago)refused to believe it. Others chuckled gleefully. Dr. Carrel was to blame only in that he did not keep on top of what was really going on in the laboratory (mostly, he wrote the papers). Dr. Parker and Dr. Ebeling probably suspected something, hence the "retirement". In the interest of truth and science, the incident should have been thoroughly investigated. If it had been, some heads might have rolled, sacrificed to devotion to a wrong hypothesis - immortality of cell strains.". Witkowski also reports Dr. Margaret Murray, an early tissue culturist, telling him that "one of Carrel's technicians of that time was passionately anti-fascist and detested Carrel's political and social ideas" and expressing her belief that "this technician would willingly have discredited Carrel scientifically if possible.". ^ "Charles Lindbergh Symposium". Archived from the original on 2012-02-07. ^ Rev. Stanley Jaki Two Lourdes Miracles and a Nobel Laureate: What Really Happened? ^ Alexis Carrel, The Voyage to Lourdes (New York, Harper & Row, 1939). ^ Carrel, Alexis (1939). Man, The Unknown (PDF). New York: Harper & Brothers. Retrieved 28 June 2017. ^ As quoted by Andrés Horacio Reggiani: God's eugenicist. Alexis Carrel and the sociobiology of decline. Berghahn Books, Oxford 2007, p. 71. See Der Mensch, das unbekannte Wesen. DVA, Stuttgart 1937. Carrel, Alexis. Man, The Unknown. New York and London: Harper and Brothers, 1939. Szasz, Thomas. The Theology of Medicine. New York: Syracuse University Press, 1977. Feuerwerker, Elie. Alexis Carrel et l'eugénisme. Le Monde, 1er Juillet 1986. Schneider, William. Quality and Quantity: The Quest for Biological Regeneration in Twentieth-Century France, Cambridge UP 1990. Reggiani, Andrés Horacio. Alexis Carrel, the Unknown: Eugenics and Population Research under Vichy French Historical Studies, Spring 2002; 25: pp. 331 - 356. Wallace, Max. The American Axis: Henry Ford, Charles Lindbergh, and the Rise of the Third Reich St. Martin's Press, New York, 2003. Berman, Paul. Terror and Liberalism W. W. Norton, 2003. Reggiani, Andrés Horacio. God's Eugenicist. Alexis Carrel and the Sociobiology of Decline. Berghahn Books, Oxford 2007. Friedman, David M. The Immortalists: Charles Lindbergh, Dr. Alexis Carrel, and Their Daring Quest to Live Forever. HarperCollins, NY 2007. Wikimedia Commons has media related to Alexis Carrel. Wikisource has the text of a 1922 Encyclopædia Britannica article about Alexis Carrel.